It’s been a while since we last posted – the pressures of family and work, and actually watching the Tour are to blame! We’ve missed so much in the last few weeks – Caster Semenya is running again, though reading anything into her performances right now is guesswork at best. Two possibilities remain, with no way to gauge them until later in the season. Then in France, Christophe Lemaitre ran 9.98s for 100m to enter the history books. Big deal, right? These days, 9.98s doesn’t even guarantee a medal at a major race (in fact, it’s almost certain that you won’t medal). But the result is significant, because Lemaitre is white…the first Caucasian man to break 10 seconds for 100m. But, the point of today’s post is the Tour de France, so let’s change gears and look at some power data, as we enter the Tour’s decisive next 3 days. 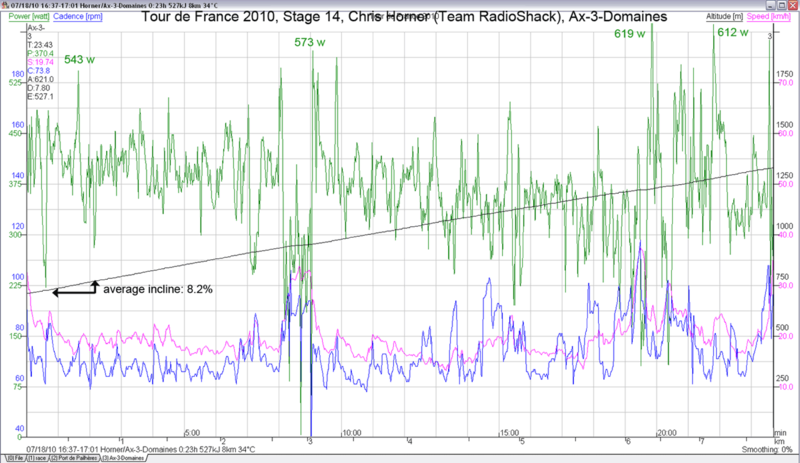 SRM – similar data, but for different teams, including Saxo and Radioshack, and a different take on some of the numbers. I’ve used the graphs from the SRM site below, only because they’re easier to follow. Both are great, and they explain the pattern of the race better than I possibly could. So when you’re done here, if you have time, it’s worth visiting them! Chris Horner: A top 15 rider (currently lying 14th), Horner has finished most of the mountain stages in a second or third batch of riders that include Ivan Basso, Andreas Kloden and within touch of Robert Gesink. Always in the top 20, he gives a good indication of what is happening at the very front of the race. 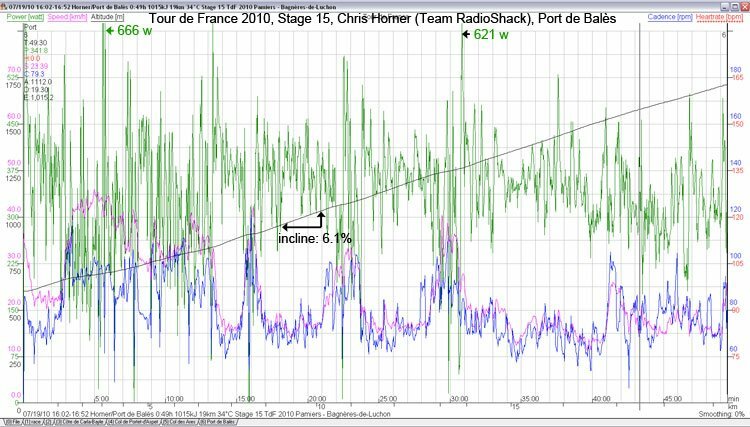 Unfortunately, we don’t get this kind of data for Contador, Schleck, Menchov or Sanchez, to really see what is happening during the attacks in the final kilometers, but nevertheless, Horner’s data is interesting, as you will see. On the short climb (3km) up to Mende in Stage 12, Horner finished 31 seconds behind Contador, having begun the climb with him. 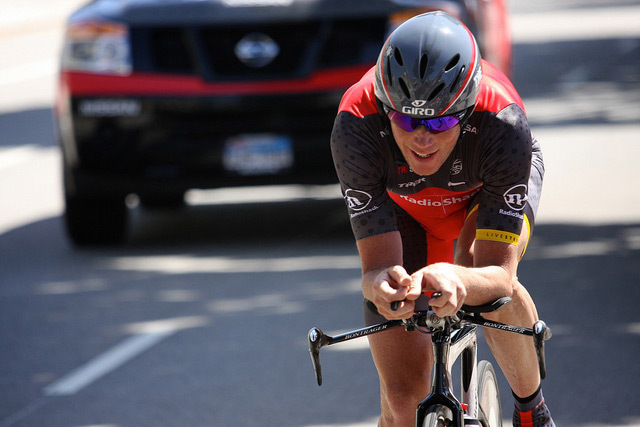 Horner’s average power output for 10 minutes of climbing was 6.6 W/kg (422W). Nothing wrong with that, it’s a really short effort at the end of what wasn’t a super-grueling day like those that followed in the Pyrenees. For context, consider Horner on Ax-3-Domaines during Stage 14. This finishing climb took him just under 24 minutes, and his power output was 5.8 W/kg (370W, 12% lower than for the 10-min climb). He conceded about 90 seconds to Schleck and Contador. Then even longer was the climb of the Port de Pailheres, which he rode in 48:37 (as did all the main protagonists, give or take a second or two), and that was done at 5.4W/kg (344W, a further 7% lower). Of course, it’s not a finishing climb, so the hammer isn’t down, but it does reflect what the peloton is doing. Also, Horner’s data from the Port de Bales are interesting. He finished this day with Basso, conceding approx. 3 minutes to Contador’s group by the finish (not 100% sure of the gap at the summit, but imagine it would be 3 min ± 20 seconds). This climb took 49:30, and was done at an average of 342W/kg (5.3W/kg – about the same as the Port de Pailheres of similar duration). 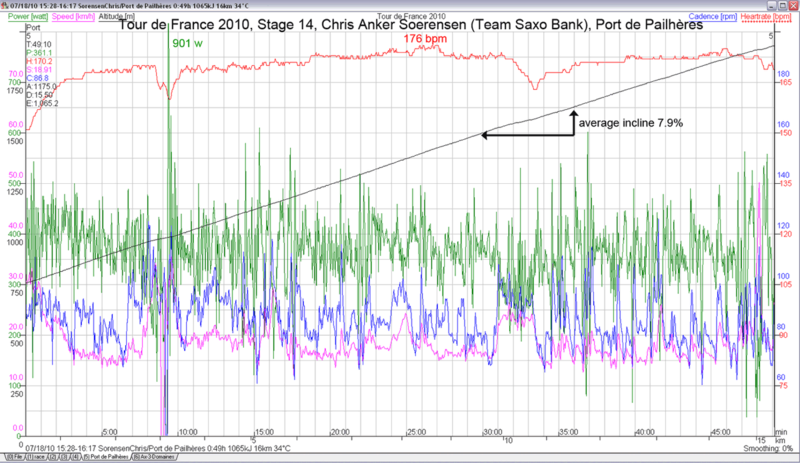 And then finally, it’s interesting to look at the data of Chris Anke Sorensen (apologies for all the graphs). Sorensen has been the last Saxo man to peel off before Andy Schleck and the GC riders duke it out, and so his numbers are fascinating because they show you the effort that has produced a thinning out of the peloton. For example, on the Port de Bales during Stage 15, Sorensen rode at the front of the peloton and was responsible for dropping all but 15 riders. Then he went off, and the attacks began. What I have to point out is that once he goes off, the overall pace actually slows DOWN, it doesn’t get faster. This is because the initial attacks are neutralized and then followed by a regrouping. On the Port de Bales climb, it was Andy Schleck who attacked, and an elite group of 5 formed. But soon, that group had swelled to about 15 again, with Lance Armstrong almost rejoining it. 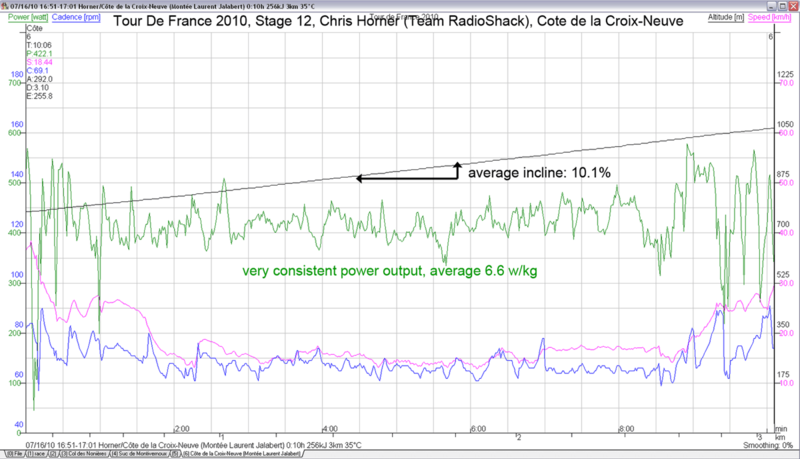 So the point is, the power output by Sorensen, in my opinion, reflects the highest SUSTAINED power output on the climb – the attacks go higher, but it’s more stochastic, with periods down below 5W/kg. So let’s look at Sorensen on the Port de Bales. He rode at the front of the peloton for 21:34 and produced an average power output of 385 W, or 6.1W/kg. As mentioned, this thinned the group to 15 riders. 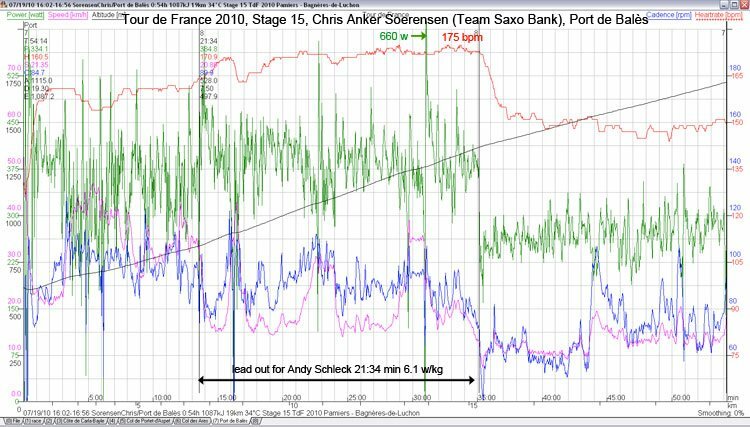 The smaller Schleck, riding behind him, would produce less than this, and is sheltered from the wind (the speed here is around 18km/h, so it’s not insignificant) – perhaps 5.7W to 6.0W/kg, and that’s a good indication of the power produced by those top contenders. So what does all this mean? First, it’s really interesting (I hope) to compare these numbers to what you may produce if you are a keen cyclist. I wish that more data like this was made available, I think it would enhance the package of cycling. But, to continue a debate we’ve been having recently, these numbers reflect, in my opinion, an overall lowering of the performance level in the Tour compared to the last 2 decades. And this is a positive sign that doping control measures are having an effect. Even yesterday on the Col du Tormalet, the climbing time was 56:30 for the Yellow Jersey, compared to that huge day in 2003, when Armstrong and Ullrich did it in 44:30. And yes, the race situation was different, but 12 minutes? That’s too big to be accounted for by strategy alone, even weather conditions (yesterday may well have been more favourable anyway). I look at numbers like 5.4W/kg for the peloton on the penultimate climb, and around 6.0W/kg on the final climb as a good indication that something is different, and in a good way. Hey, they may even reach the much-maligned 6.2W/kg for a climb like Ax-3-Domaines, but the contention (mine and Sassi’s, and probably other’s) that it’s not physiological to ride at around 6.2W/kg or higher for 40 minutes seems, at least so far, unchallenged in the “real world”. Ax-3-Domaines was done at 5.8W/kg by a rider 90 seconds down. It would be pretty easy to make the calculations for Contador and Schleck, using the SRM data to validate the accuracy of the assumptions you make. Feel free to go for it! I, on the other hand, had better get some student exam marking done! Enjoy the showdown on the Tourmalet tomorrow!